The dynamic but dangerously fractured relationship resulting from an emotional past between fellow Time Agents Captain Jack Harkness and Captain John Hart was enrapturing during the second series of Torchwood on television, revealing so much about Jack’s past while teasing at what must have been with these two at one time together. Having spotlighted every core original Torchwood Three member, revisited the lesser-seen characters of Yvonne Hartman and Suzie Costello, and delved into wholly new times and settings, Big Finish now sets its sights on the return of John Hart with a rollercoaster ride through history in the start of the newest series of Torchwood adventures, ‘The Death of Captain Jack’ by David Llewellyn. It’s never quite explicitly stated where this story takes place in regards to the personal continuities of Jack and John, but John has finally found a way of besting his rival once and for all by quite literally taking his place in a power move so profound that all of time is put into flux with Jack on the verge of meeting one final and lasting death. There’s never been any doubt that the immensely charismatic John is both egotistical and megalomaniacal as he flirts with amorality, and those expecting this scenario to play out in a series of over-the-top vignettes filled with bravado and crudeness to match John’s persona and ambition on television will be in for an unabashedly glorious treat. The humour is both risqué and macabre in equal measure, and John has absolutely no concern about who gets hurt either directly or indirectly as he interferes with established continuity to remain entertained. To be sure, by establishing himself as King of England, remodeling the Statue of Liberty in his own image, helping Victoria reclaim the United States with threats of laser guns, and even faking an alien encounter in Roswell among other deeds, this is a man who needs a lot to be entertained. The issue with any story like this, however, is that it’s all fun with no real substance because nothing that happens will ultimately have any meaning for the world or universe at large. With this romp demonstrably showing that there are absolutely no restraints in regards to bombastic visuals and flamboyant set pieces, the extremes shown might thus be off-putting to some precisely because they are all spectacle. Ultimately, though, it’s the immense talent of both James Marsters and John Barrowman that keeps this series of vignettes from collapsing upon itself with its multitude of cameos and blistering pace. Marsters steps back into the role of Hart with aplomb, confidently and effortlessly delivering one-liners and retorts to every situation before him as this rewritten world continues to become ever more ridiculous to match its maker’s whims. On the other end of the spectrum, while John Barrowman once more perfectly plays the traditional poised and compelling Captain Jack when required, this turn of events also allows him to brilliantly portray a more subdued and reflective man who understands exactly why the universe is contracting while death reaches out to finally claim him. Torchwood only had two episodes to dedicate to this fascinating relationship, and Llewellyn and Big Finish understandably revisit the carnage that ensues when these two former coworkers and lovers are together while amplifying the scale and scope to their most extreme. 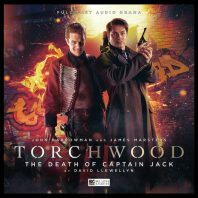 Although ‘The Death of Captain Jack’ doesn’t tread into new narrative territory or deliver heavy-hitting character exploration of John in particular given his thought processes on screen compared to his actions here, it presents a confident trek through Torchwood’s history that spectacularly delivers on its promise of immense entertainment even if everything shown is reverted by the end.